The Brunner Ltd. is capable of manufacturing custom machines and complex components with its CNC metal forming center and CNC lathe machine. 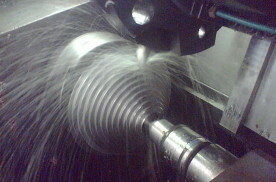 CNC metal forming, also in the case of larger pieces as well. Our company undertakes CNC jobs,, metal forming, CNC milling, CNC turning, grinding, locksmith work and welding related to this, flame and plasma cutting, even in case of large pieces with professional equipment, reliable, experienced professionals. We are equipped to do turning, milling, plane jobs, drilling, grinding, bending, sheet cutting on traditional cutting machine, but the modern CNC turning and milling machines, shaping/forming centers, CNC grinding machines, CNC plasma and flame cutting equipment are at our disposal too. Our diverse machine park makes it possible to cut, not only simple, but also complex parts on CNC machines and the production of custom parts, since our expert team is equipped to create complete machines from ‘a piece of iron’. where the machined parts, machine units and complete machines, equipment can also be found. kayak and canoe underwater starting machine lines. With our metal forming service we are available to those who may only need repair, or restoration of some existing parts.